Terri Hallesy talks to students at the STEMposium, an event hosted by St. Elmo Brady STEM Academy. St. Elmo Brady STEM Academy welcomed two IISG specialists to their roster of teachers recently. 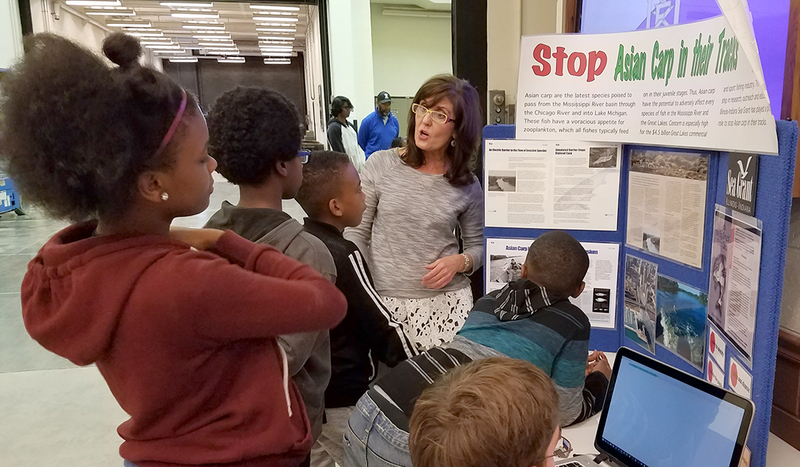 Climate Specialist Molly Woloszyn and Education Coordinator Terri Hallesy carried on in the spirit of the academy by sharing their expertise with underrepresented fourth- and fifth-grade students in the Champaign, Illinois area. The program was developed in 2013 by Ricky Greer, a K-12 education specialist, and Dr. Jerrod A. Henderson, a University of Illinois lecturer in Chemical and Biomolecular Engineering (CHBE). Its name, St. Elmo Brady, honors the first African-American student to earn a PhD in chemistry in the United States in 1916. Although the program is housed in CHBE, it’s meant to introduce students to a range of STEM disciplines. Woloszyn and the students toured the weather station with Jim Angel, the Illinois state climatologist. She also did an activity that demonstrated air pressure – the collapsing can. She then taught them how to make a rain gauge from a 2-liter bottle that they could take home. Hallesy spent her time with the students talking about the role aquatic invasive species play in altering the Great Lakes basin ecosystem. She used fun games like “Stop Asian Carp in their Tracks” and “Nab the Aquatic Invader,” to explain how students by making simple changes, like properly disposing of a pet fish, can do their part in helping to prevent the spread of AIS. Program director Joe Gamez has seen the positive impact the program has had on the students. “Without this exposure, minorities and girls think, ‘Oh, this this is not for me. This is for other people. Other people do that kind of stuff,’” Gamez said.